If you’ve ever wondered what the Beach Boys were singing about in “Little Deuce Coupe,” this is it – a 1932 Ford Coupe. (“Deuce” simply refers to the “2” in 1932.) These were modest, reliable cars, available for around $500, equipped with wire wheels, black fenders, and a rear-mounted spare wheel. In the years following World War II, hot rod culture blossomed in California. 1932 Fords were readily available and inexpensive, so they became a popular choice for hot rodders, who would soup up the engine and strip off non-essential parts to reduce the weight of the car. Known as “The Holy Grail of Hot Rods,” Deuce Coupes were so coveted for hot rod conversions that unmodified versions are now extremely rare and sought after by collectors. In fact, the cars are still so popular today that Ford recently announced that they would offer new 1932 Ford 5-Window Coupe body shells. These reproductions, built by United Pacific Industries, will set you back around $21,000 – and remember, that’s just for the steel body shell. In the climax of the classic 70s car film American Graffiti, a canary yellow Ford Deuce Coupe driven by the character John Milner (Paul Le Mat) faces off against a black ’55 Chevy not-so-ably piloted by Bob Falfa (a very young Harrison Ford). Director George Lucas reportedly chose the Deuce Coupe for the film because it brought back memories of 1960s street cruising in his hometown of Modesto, California. 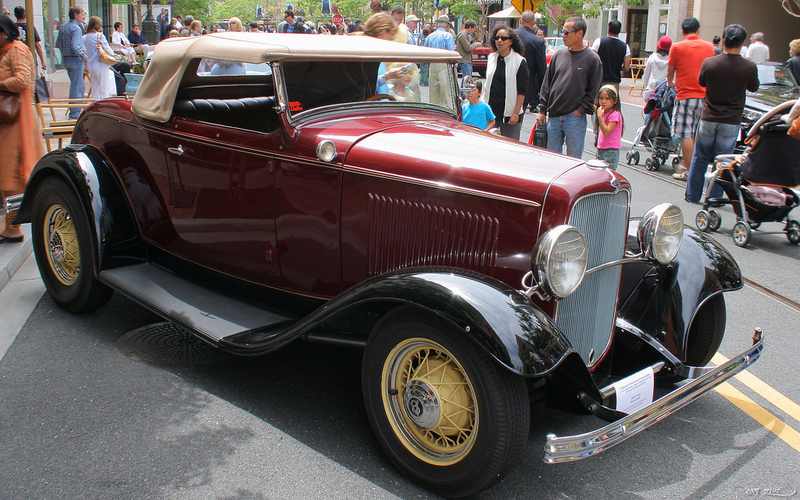 My first car at age fifteen was a 1932 foed model b coupe. My dad bought it at a farm auction for fifty bucks. I wish I still had it! I could not to wait to trade it for a 39 or 40 ford, the most popular car in our Nebraska town. Wow! That’s a great first car, Stan! Mine was an old Ford Explorer–definitely not as cool as a Model B Coupe.